Lianne and Gary were childhood sweethearts who drifted apart, lived different lives hundreds of miles apart before finding each other and falling in love again! They tied the knot on Saturday 7th September 2013 at the Green Man in Fownhope, Herefordshire. As their wedding day drew closer, Gary and Lianne made a last-minute decision to replace the planned CD music for the ceremony with a live harpist and booked Hannah for the ceremony. To complement her elegant bridal gown, Lianne chose a Princess Sophie tiara from Aristocrat Tiaras together with a Duchess Elizabeth necklace and a bespoke pair of earrings. The Princess Sophie tiara and earrings were carefully selected to match Lianne's hair style and colour whilst the Duchess Elizabeth necklace was chosen to accentuate the cut of the gown. 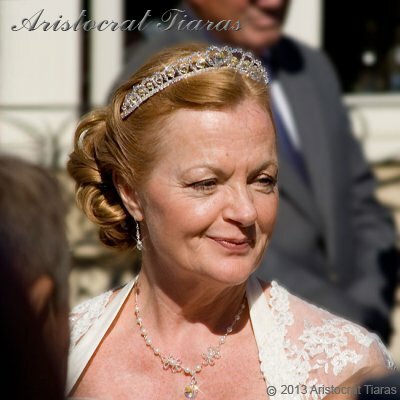 The 200 high quality Swarovski AB crystal beads of the tiara sparkled magnificently under the light throughout the day, adding a real touch of flair and class to the special day.